Trujillo is a somewhat sepia toned town; clothes on the washing lines, fluoro advertisementsand even sunflowers seem to jump out from a background of muted colour. In the parts of Alto Trujillo and Milagro, mud-brick homes have sprung up in the valleys of the sand dunes and the roads are still loose with dust. This is home to some of Trujillo’s poorest children and this is where we teach. There is no running water in many of their homes; some of the children brush their teeth at school. Others kids will stay up until 1am working at recycling plants. Before Espaanglisch (a non-profit organisation based here), English was not a part of their curriculum and many of the kids fell behind in secondary school where the subject is compulsory. We hope that English will be invaluable to them both inside and out of the classroom. The kids give you endless hugs, kisses and stickers. 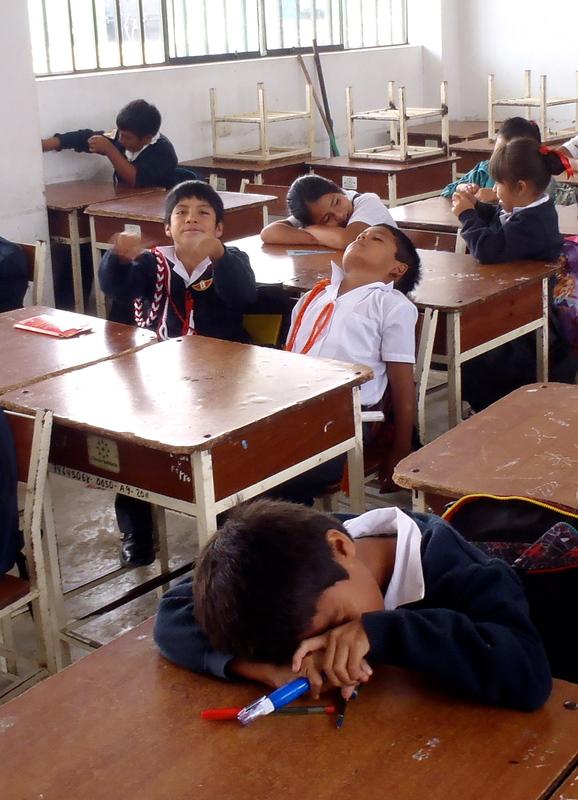 Despite this, walking into a classroom full of Spanish speaking Peruvian kids can be overwhelming. But support is never lacking here in the volunteer house, where a beautiful set of hard working volunteers live. I was welcomed as if it were my home already and eased into a life of combi-van transport, guinea pigs, lesson planning, children’s songs and storybooks. STORY TIME with Houdini the Disappearing Hamster. The closest thing they have to a hamster here in Peru is a guinea pig, also known as a cuy, also known as dinner. so of course when i opened up the first page to: “It’s dinner time.. but oh no- where is Houdini?” the kids would have assumed that we need to find him to eat him! so i also had to explain that in Australia/America/England, we don’t eat the hamster. the hamster is our pet! Espaanglisch has given me the opportunity to teach and learn from 4-year-olds all the way through to mature adults. English is such a valuable tool today, one that can truly make a difference to people’s lives, so any time with Espaanglisch is time well spent. And though Trujillo may seem a little dusty on the offset, the people you meet here and the children you teach give this place it’s true colour.